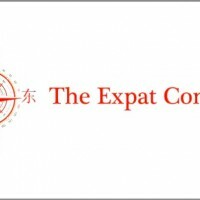 This coaching model is targeted for working with people (assignee / family member(s)) who are planning a move abroad or who already have experience of their new home location since the first few months. 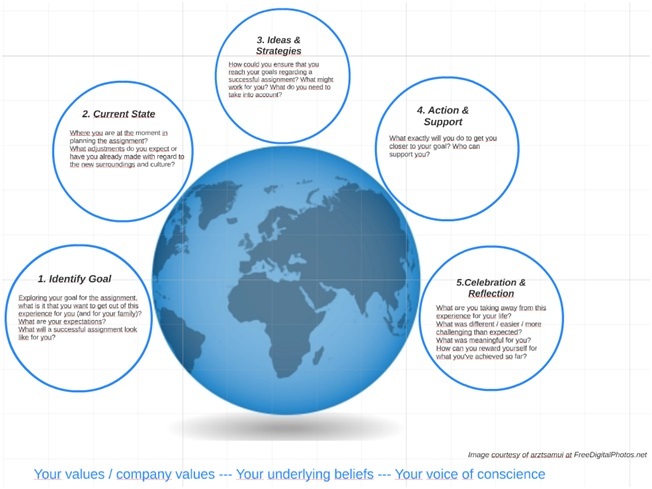 The purpose of this model is to serve as a guiding framework in coaching to support you and/or your family settle into your new home country, to conquer the challenges that most people face when living in a new cultural environment as well as help you as well as your employer make the most of a meaningful, successful assignment. This coaching model has its roots in the GAINS Coaching Model ((c) Angela Phillips-Stockwell) as well as on the Logotherapy philosophy developed by Dr. Viktor Frankl. 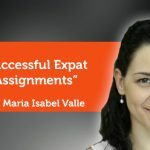 One of the major factors on an assignment is that the assignment will work well both from the point of view of the assignee as well as for the accompanying family. Some companies offer resources such as training on cultural differences or language training for assignees as well as their families to ensure a good ROI from the assignment. 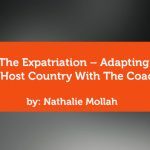 Coaching may be an additional helpful tool to ensure your awareness of the essentials both when preparing for the move as well as when already dealing with the cultural differences. 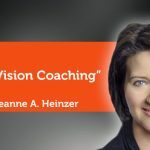 The underlying philosophy in this coaching model is very empowering; it assumes that you have the resources and the strength to find the responsible, constructive, positive way forward in your life – whatever the situation/challenge at hand may be. In life there are both situations we can shape; such as the decision to go abroad, as well as situations we cannot change; such as the culture of your new home country. In the latter case we still can freely choose to take a stand towards the situation. What stand do you choose to take? Your values, your underlying beliefs and your voice of conscience will be explored during our sessions. By building more self-awareness around them will help you to understand how they affect your experience of the assignment as well as how to use your strengths to your advantage. This coaching model represents the full coaching process during the coaching engagement of (typically) 3-6 months. The process is always flexible according to your needs and the questions below are just examples. We will start by exploring your goal for the assignment, what is it that you want to get out of this experience for you and for your family? What will a successful assignment look like for you? 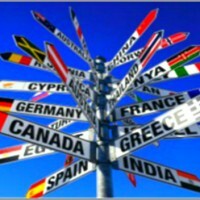 What do you already know about your new home country and culture? What does failure look like for you and how can you prevent that from happening? What do you want to be remembered for (at work/within your family/on the assignment)? How comfortable are you with change? What are you prepared to change? What's within your control? What's your responsibility? Here we explore where you are at the moment in planning the assignment or already in adjusting to the new surroundings and culture. Where are you now with regard to preparing for your assignment? What do you think you (& your family) need now? What are you doing now/what did you try before to get you closer to X? What did you already achieve / what worked well for you? What is stopping you from getting what you want?/ Where do you get stuck? What areas of your life are impacted by this change? What are you good at? What do you love doing? What is important to you? What are your values? Where do you take pride in yourself? What do you enjoy in the current situation? What would happen if you didn't change? Next we will explore strategies and new ideas that you perhaps haven’t yet thought: what might work for you in order to get a step closer to your goal? What are you prepared to try? What if you could not fail - what would you dare to try? If your friend was in this situation, what would you advice them to do? What will it take to change this situation/to get to your goal? What are you prepared to give up to get to your goal? What did your role models do/try? What made them successful? What if you had unlimited money/time? What does your heart tell you? To whom is the change important? How would someone else (parent/child/friend/boss/coworker) look at the situation? From planning to action; here you will make your concrete action plan: what exactly will you do to get you to your defined goal? What could you do today to bring you closer to your goal? What small step could you take to make this happen? What are you prepared to do every day for a week? How could you make this a part of your routine? What support will you need? What in your life already can support you? What are you ready to commit to doing (and by when)? What would you like to be held accountable for? How will you know you’re making progress? Changing your behavior is never easy. Changing the way you work, the way you approach people or being open about the way you look at something new requires mindfulness, energy and willpower. We will take time to acknowledge your successes and reflect on the impact of your relocation experience. What's different now than when you started? What was different in the process from what you imagined? What was easier / more difficult? What are you taking out of this experience for your life? What was the meaning of this "exercise"/change for you, for your life? I have a Finnish passport and have lived and worked in Germany and Switzerland (also studied for short periods of time in Sweden as well as France) for the past 8+ years. My two kids are both born in Switzerland, where I live and work with my Finnish husband since 2006. I’ve worked in global virtual teams in Learning & Development within the telco as well as financial services industry, where I’ve been responsible for developing online/face-to-face/blended soft skills learning programmes for global audiences. I’m particularly passionate about cross-cultural understanding as well as leadership development. My belief in that you have the strength and the resources to master with respect and grace any situation or challenge that life offers you. The setup is geared towards an arrangement where your company supports you (and/or your spouse) to get a coach to support your international assignment. If you opt for engaging with a coach privately, the below set up still applies except for the parts involving your manager. Our engagement starts with a chemistry session, where you can determine if I’m the suitable coach for you. Our engagement starts with an initial session together with your manager where we will the discuss goal-setting for the full coaching engagement as well as your manager’s expectations for involvement/support/status updates along the way. A coaching engagement typically lasts for 3-6 months with weekly or bi-weekly sessions. One session lasts 1 hour. All coaching sessions are confidential between the coach and the client. No specifics of the coaching sessions will be shared with your manager unless specifically agreed with you. The sessions can be conducted face-to-face or via phone/skype. At the end of the coaching engagement we will have again a completion meeting together with your manager. You can connect with us in a variety of ways.